Biswa's Blog: Selfie time with Tata Tigor! Selfie time with Tata Tigor! Love to click selfies? Dreaming about winning a stylish makeover? Well, then a fantastic news is waiting for you. Check out the malls in your city and look out for Tata Tigor in display there. Just pick a new style with a makeover. Unlock your smartphone and click a gorgeous selfie with the Tata Tigor. 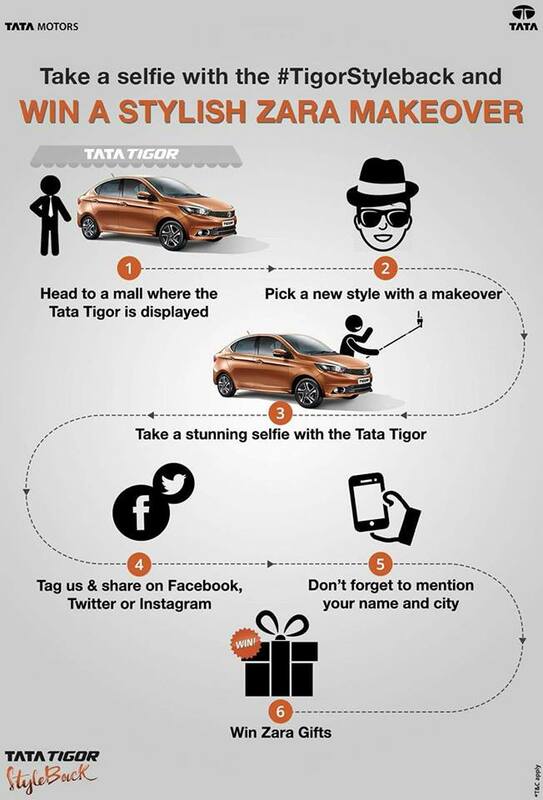 Share your #TigorStyleBack selfie on Facebook, Twitter and Instagram along with your Name and City. Then relax, cross your fingers and pray. You might win a stylish Zara makeover. Sounds cool, right? What are you waiting for? Rush towards your nearest mall. Good luck! Tata Tigor is cute car. waiting for your new blog. ZARA make over for girl and what about BOys. Ladies skirts are a stylish, feminine and versatile pieces of clothing. In the summer they are comfortable and cool and in the winter can be worn with tights for an elegant but bissq outfit. Skirts can work well for smart work wear, occasion outfits, evening wear and casual depending on which skirt you choose. nice post...thanku for sharing with us this post.